Furthermore, I have my own studio in Bangkok’s Sukhumvit business area near the Phra Kanong Sky Train (BTS) station. It is equipped with high end cameras, lenses, lighting equipment, backgrounds, make up, and fitting room. Also, I shoot on any location of your choice like: companies, offices, factories, hotels, resorts, restaurants and stores. For make up, styling and image retouching, I work with international specialists with expertise in their fields. Some of the movies and documentaries which I worked on have been screened in film festivals in Europe, Canada and Brazil. I worked as a cinematographer on the TV documentary “Bahnsteig 1: Rückfahrt nach Flatow” which won the best documentary at the Neisse Film Festival 2013 in Germany. 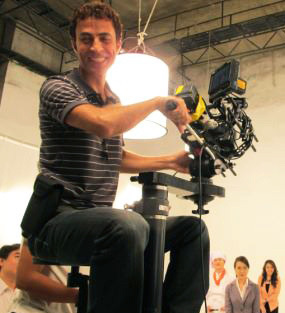 In Thailand, I’ve worked as a cinematographer for TV commercials for Nok Air, Tanachat Bank, Standard Chartered Bank. On top of this, I have significant experience making image videos and presentation videos for European and Asian companies based in Bangkok / Thailand.